How Much Do You Know About Basic Nutrition? Home > Questionnaires > How Much Do You Know About Basic Nutrition? 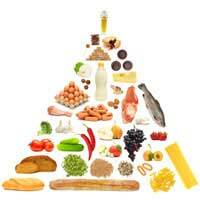 Most of us strive to have a healthy diet, and make sure that our families eat healthily as well. While that may sound straightforward, preparing meals that are both healthy and satisfying, and eating only nutritious snacks, is not always an easy task. Are you really getting the balance right? What is the best source of vitamin E, which can help prevent against heart disease and prostate cancer? We get omega-3 fatty oils from consuming certain foods. Which food listed below would be the best source? What percentage of your daily diet should, ideally, come from fat? How many servings of fruit and veg are recommended per day? All of these are good sources of vitamin C, but which one has the most of this important nutrient? All of these contain a good supply of calcium, which is needed for strong bones and teeth. Which has the most calcium? A lot of foods get bad reputations over the years, when research comes out claiming it is good or bad for our health. Which of this much-maligned foods is now thought to be very good for us - in moderation? Research has shown that we need some fat in our diet, and that there are “good” and “bad” fats. Monounsaturated fats in particular can be an important part of our diet. Which is a good source of monounsaturated fat? Answers: Believe it or not, the correct answers are all number one. If you are answered yes to the first answer on the list every time, then you got all the answers correct! You know a lot about nutrition, and try to eat right. Healthy eating is all about making the right food choices. What we eat and have a tremendous effect on our overall health, and the food choices you make will reduce your chances of getting certain diseases. Eating healthily can help reduce your risk of heart disease, certain types of cancer, and diabetes. It can also help cut down the chance of getting depression and other illnesses such as Alzheimer’s disease.